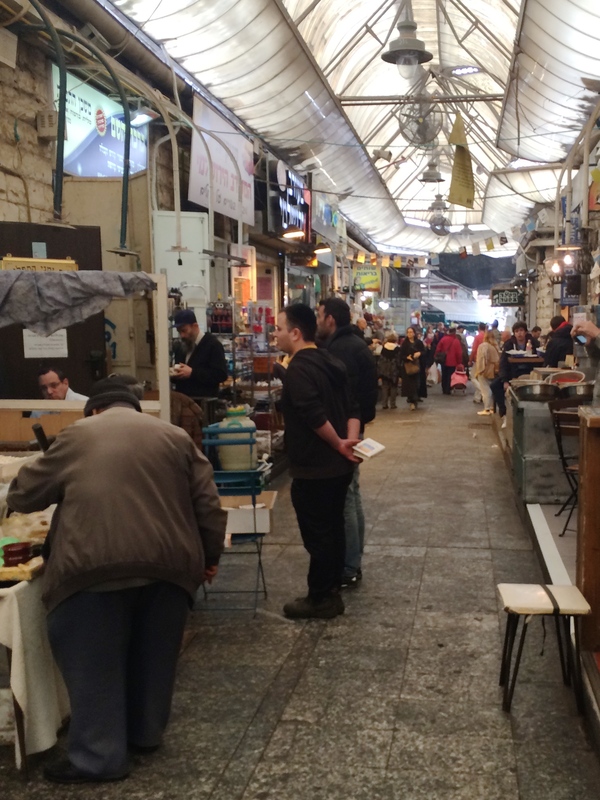 We finally had a spare moment to be tourists in Jerusalem, and we took advantage of the free afternoon by visiting the Mahane Yehuda market in downtown Jerusalem. We spent the afternoon shepherding our kids (the only kids at the market who weren’t in strollers) between vendors and trying to keep other shoppers from tripping over them. 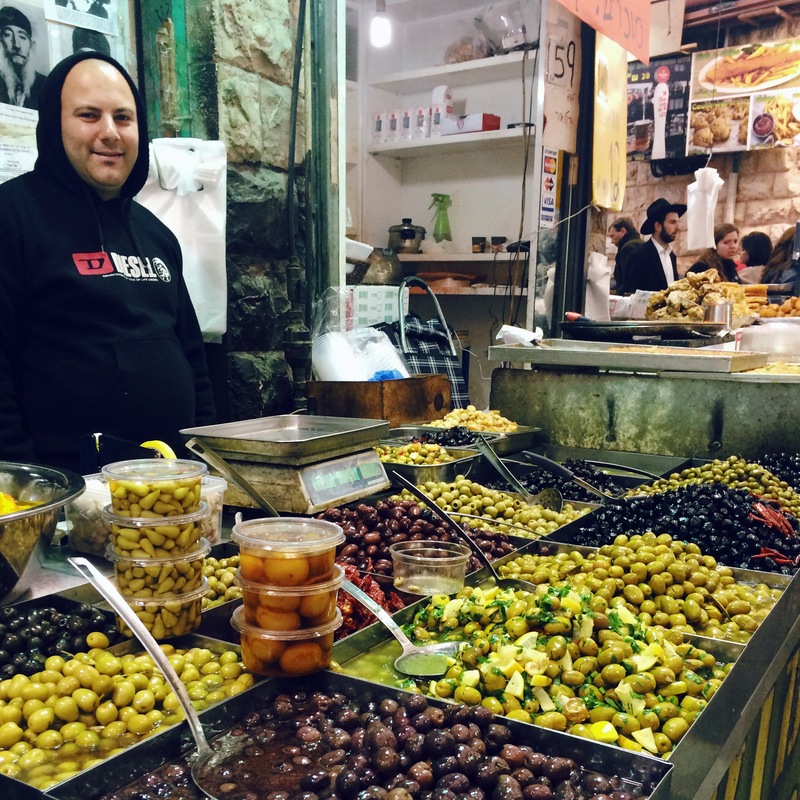 I’d been trying to figure out where Jerusalemites do their grocery shopping—certainly the grocery store by our house is outrageously expensive, and I was delighted to find that the market prices were more than reasonable compared to what we’d been purchasing. The whole market was a sensory overload for me and the kids, but a wonderful one! We walked past this oil painting stall several times, and we finally decided to stop so that Bertrand could browse. While he was looking at paintings, Jasmine charmed the vendor, and then was charmed herself. 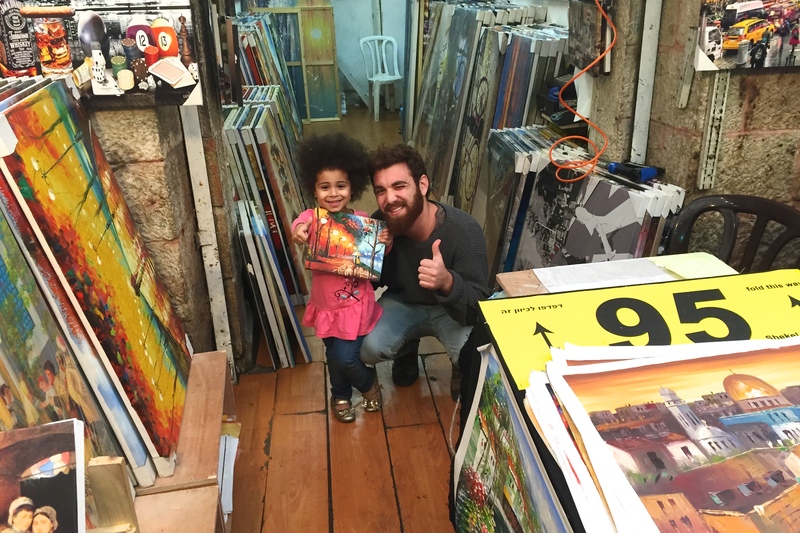 After he took out some kid sized paintings for her to look at, we were charmed too. We didn’t see anything we had to buy right then and there, but Jasmine was so fascinated by the artwork, we decided to let her pick one out for her room. She knew exactly what she wanted, and picked out the painting below. For $13, it was s steal. Before and after painting purchasing, we loaded up on vegetables. I bought a lot of olives. My favorite flavor right now is a little sour and a lot spicy (they’re hidden behind the scale). I asked this vendor if I could photograph his stand, and he couldn’t decide whether he wanted to be in the photo or not. Finally, he decided to stand stoically behind his wares. After wandering around for an hour or so, we were all hungry, and the kids were getting tired. Bertrand spied a schawarma stand, and we quickly bundled the kids into a corner table. I wish I’d thought to take a picture of their sign, even though I don’t read Hebrew. The food was fantastic, and the wait staff were truly kind to our children. 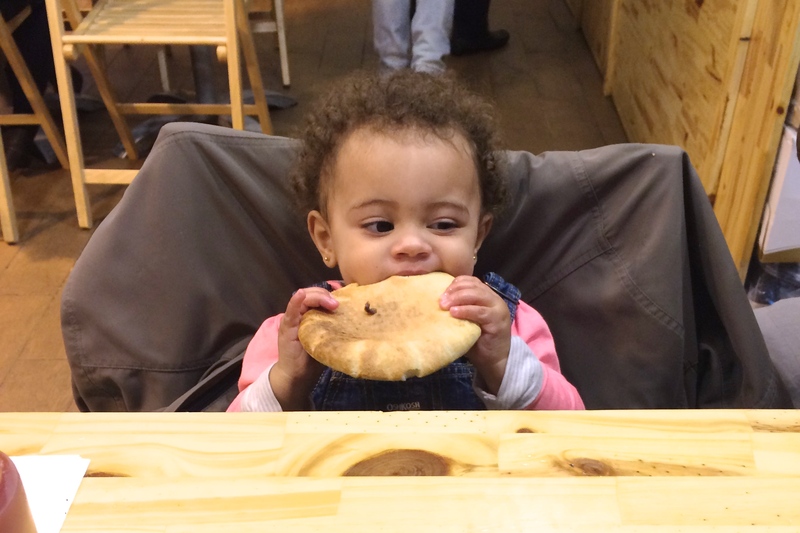 Grace wouldn’t stand for just part of a pita. Thanks for your post. I love reading your perspective of Jerusalem. I also like your comment about kids being integrated into everyday life. I increasingly feel we don’t do that well here. I love this market! Be sure to try the sahlab (hot drink) they have in winter – sooo yummy. And there’s a quirky pottery store (it has a door and windows) near one of the entrances that had beautiful (albeit pricey) pieces. I have a pomegranate and a spoon rest from there that are among my favorite possessions. Glad you guys are enjoying exploring :-).